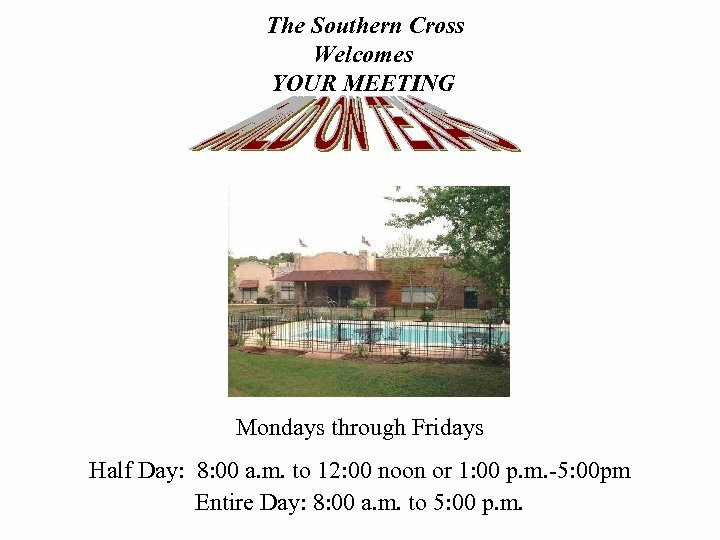 The Southern Cross Welcomes YOUR MEETING Mondays through Fridays Half Day: 8: 00 a. m. to 12: 00 noon or 1: 00 p. m. -5: 00 pm Entire Day: 8: 00 a. m. to 5: 00 p. m.
Where else but the Lone Star State will one find everything from a tropical paradise to rolling pine covered hills to vast expanses of wide open “country”. 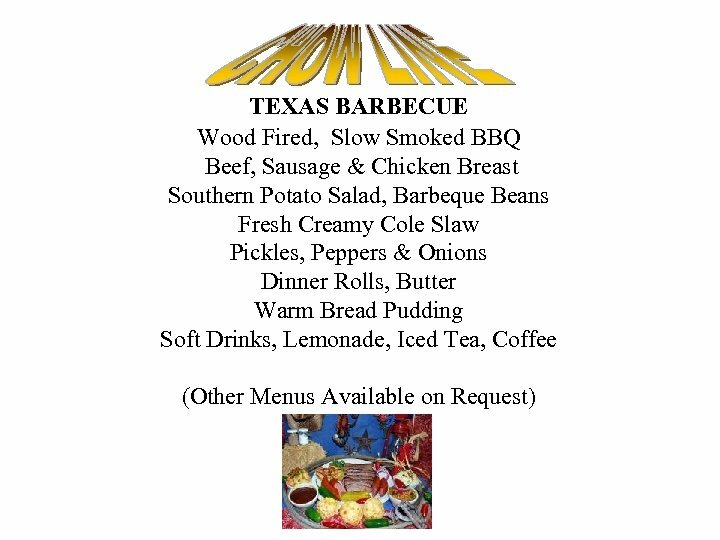 At The Southern Cross, we’re serving up “Texas”. 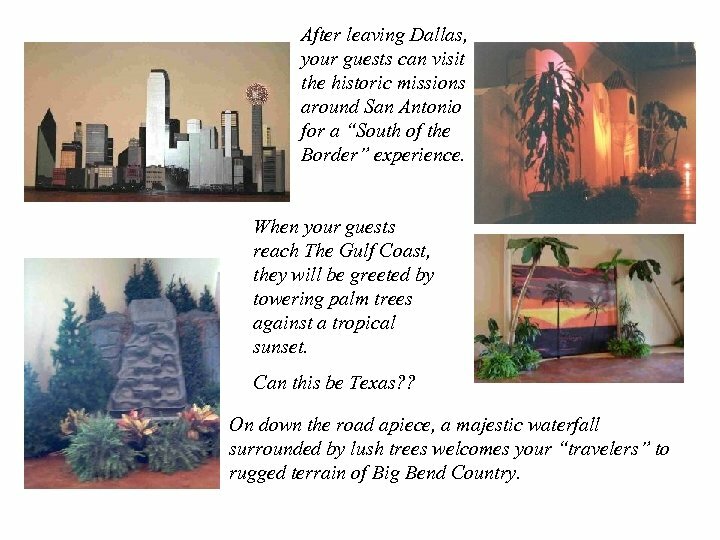 Come along with us for a tour of San Antonio, Dallas, Fort Worth, the “Gulf Coast” (Corpus Christi, Padre, etc. ), New Braunfels and Big Bend Country. Inside the Main Pavilion, tables will be covered in burgundy linen accented with burlap bags. In the center, an eclectic dried floral arrangement serves as a centerpiece. 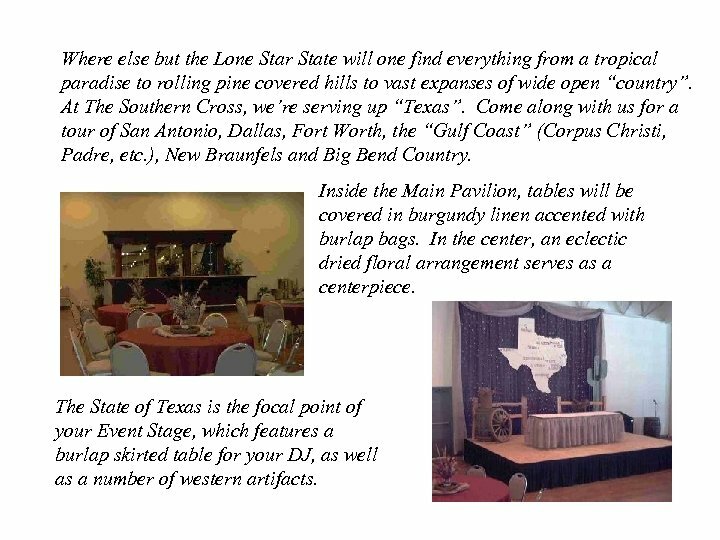 The State of Texas is the focal point of your Event Stage, which features a burlap skirted table for your DJ, as well as a number of western artifacts. After leaving Dallas, your guests can visit the historic missions around San Antonio for a “South of the Border” experience. When your guests reach The Gulf Coast, they will be greeted by towering palm trees against a tropical sunset. Can this be Texas? ? On down the road apiece, a majestic waterfall surrounded by lush trees welcomes your “travelers” to rugged terrain of Big Bend Country. 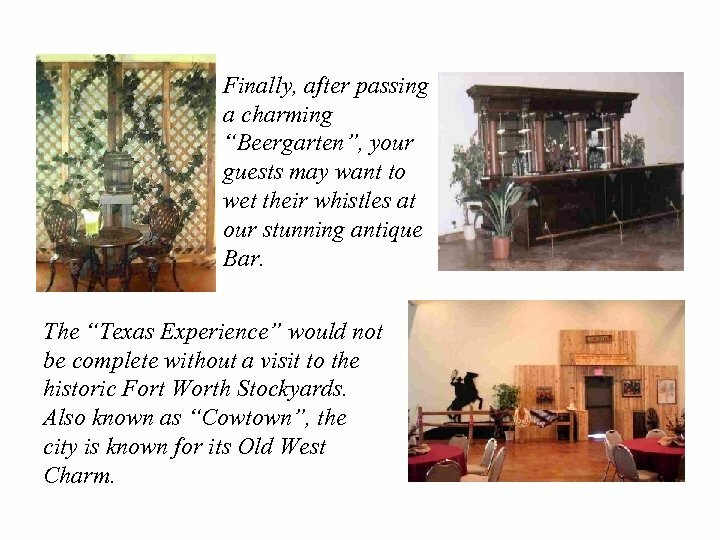 Finally, after passing a charming “Beergarten”, your guests may want to wet their whistles at our stunning antique Bar. The “Texas Experience” would not be complete without a visit to the historic Fort Worth Stockyards. Also known as “Cowtown”, the city is known for its Old West Charm. 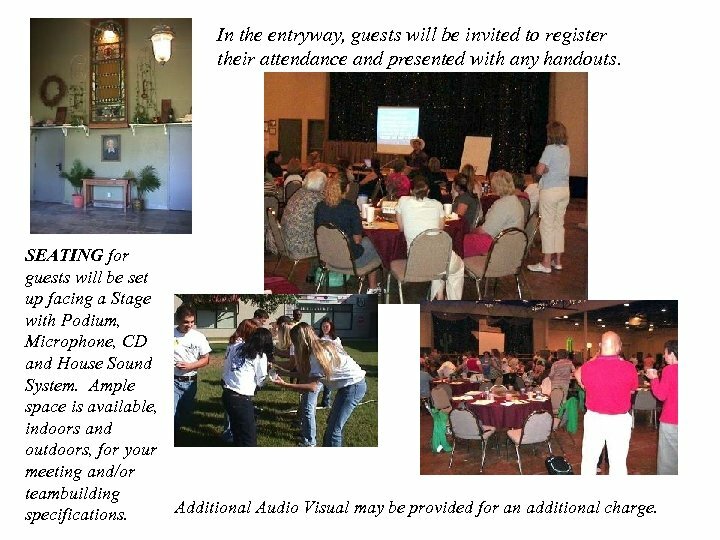 In the entryway, guests will be invited to register their attendance and presented with any handouts. SEATING for guests will be set up facing a Stage with Podium, Microphone, CD and House Sound System. Ample space is available, indoors and outdoors, for your meeting and/or teambuilding Additional Audio Visual may be provided for an additional charge. specifications. $ PRICING $ The Cost for this Event is $15. 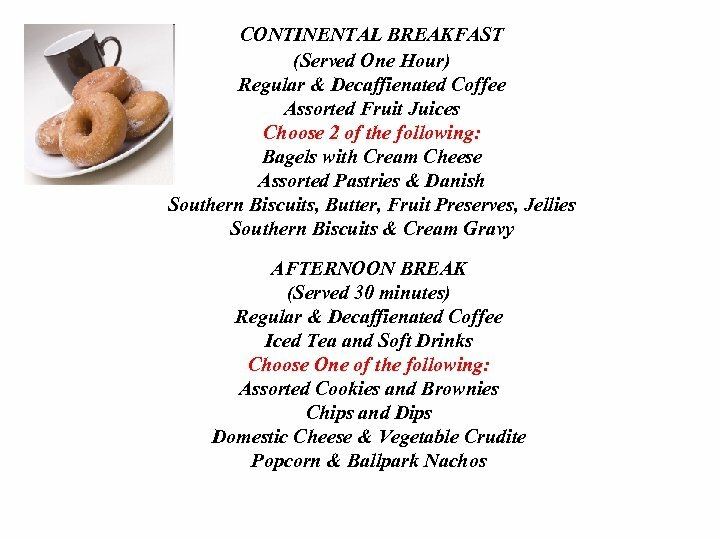 00 person for a Half Day Meeting with one meal or $25. 00 person for an Entire Day with two meals, plus tax if applicable, based on a minimum guarantee of 50 guests. 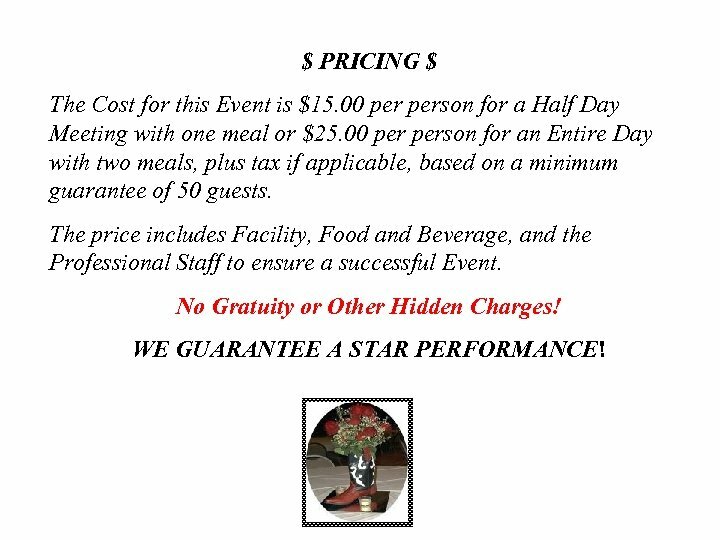 The price includes Facility, Food and Beverage, and the Professional Staff to ensure a successful Event. No Gratuity or Other Hidden Charges! WE GUARANTEE A STAR PERFORMANCE!